Summary (from the inside flap of the book): Ernt Allbright, a former POW, comes home from the Vietnam War ad changed and volatile man. When he loses yet another job, he makes an impulsive decision: he will move his family north, to Alaska, where they will live off the grid in America's last true frontier. Thirteen-year-old Leni, a girl coming of age in a tumultuous time, caught in the riptide of her parents' passionate, stormy relationship, dares to hope that a new land will lead to a better future for her family. She is desperate for a place to belong. Her mother, Cora, will do anything and go anywhere for the man she loves, even if it means following him into the unknown. Review: I am emotionally spent having sobbed for the last hour and a half of reading this book. What an amazing novel. It is at once, tragic, love-filled, powerful, intense, touching, and overwhelming. 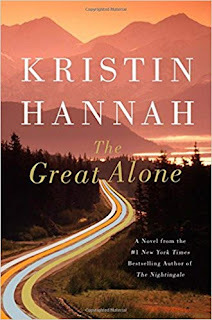 I got The Great Alone from the Book of the Month, even though I wasn't convinced it was my kind of book, because I kept seeing good reviews of it. Then I put off reading it for months. Well, how wrong I was. Leni's story is so intense, in both positive and negative ways. Stories of abuse are always tough to read as I so desperately want the character to leave. Just get out. But they don't and can't. This one is done beautifully. And Alaska. I've never been there, but this book captures the ruggedness, the beauty, and the isolation well. It seems like the kind of place that either kills you or makes you the person you were destined to be. 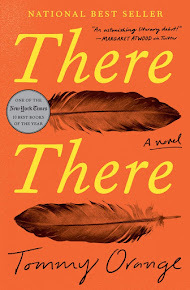 If you want to read a novel that will pull you in to the characters, the setting, and the plot, that will make you feel like you are part of the process, read this book.